Cloakroom is available during the following hours at the venue. Use of the cloakroom is free of charge. 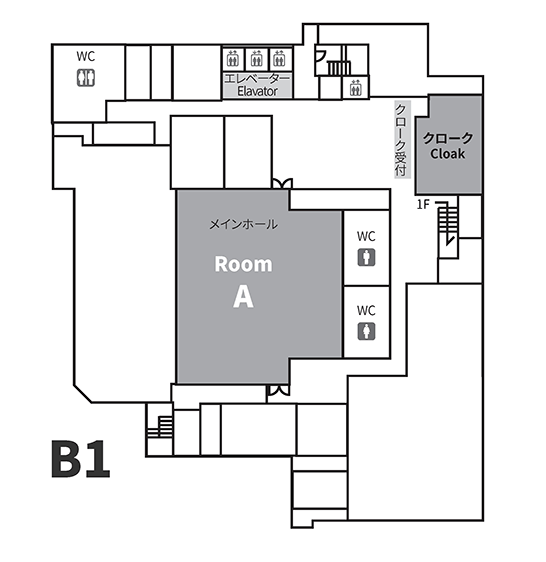 The cloakroom is B1F at Kobe International Conference Center (see the map below). We keep your luggage only on the day (same day storage only). You will receive a number disc which corresponds to the location of your luggage. If you lose the disc, you could not receive your luggage. When you pick up your luggage, please hand your number disc to the cloakroom staff. Please bear in mind that we do not hold any responsibility for loss or damage of your items. Luggage may not be left overnight in the cloakroom. Any luggage left at the end of this conference will be handed into the headquarter. In case of emergency, the cloakroom will be closed immediately. Participants cannot return to the cloakroom to retrieve items.